NextA history of the First World War: No.12 Mons, the British baptism of fire. Is Archangel Michael, the ‘Angel of Mons’, who saved the British? In the sweltering heat of August 1914, the British arrived at the Battle of Mons to check the advance of the German army. At the end of the first fiercely contested day of battle (23rd August), the British stood defiantly against the Germans, who seemingly didn’t know the word retreat. They attacked British defensive lines along the Mons-Conde Canal in attack after attack en masse. British ‘Tommies’ fired a relentless barrage of fire -fifteen rounds a minute- but to no avail. With Mons on fire and many of the surrounding villages too, a heavy smoke draped the sky. The British had no choice but to withdraw so that they would not be encircled by the Germans. It is here, that from the heavens angels converged down upon the British enemy. These angels supposedly shielded and protected the British until they were safely in their new defensive lines. 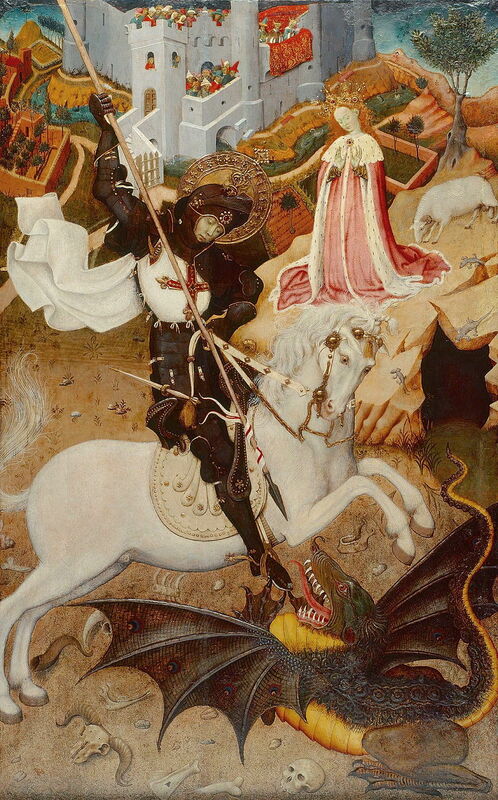 St. George slaying the dragon, in this fifteenth century painting by Bernat Martorell, represented for many people the savior ‘The Angel of Mons’, who ‘slayed’ the Germans. Contrasting accounts of this story exist in many different forms, which include versions that say it was St. George, himself, who thwart the Germans on the Mons-Conde Canal. Other accounts include a medieval cavalry and archers saving the day. The origins of this ‘Angels of Mons’ myth can be traced back to the original fictional story recreated by journalist, Arthur Machen. His story describes a phantom bowmen from the battle of Agincourt coming to the rescue of the British. However, whatever these British soldiers on the 23rd of August 1914 saw, was probably due to the effects of fatigue and the state of the glowing red sky (illuminated by the smoke, fire and the setting sun.) Though Personally, I quite like the idea of bowmen descending from the sky or even the thought of a divine St. George crushing ‘evil’ beneath his foot. 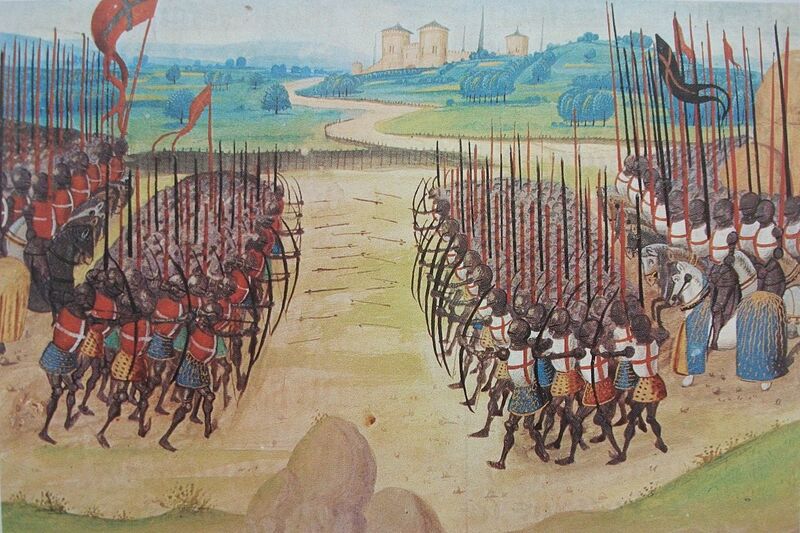 The inspiration behind Arthur Machen’s story was the bowmen depicted in this early 15th century painting of the Battle of Agincourt. This is a postcard depicting the famous story of divine intervention by angels at the battle of Mons. From a painting by W.H. Margetson. I love those beautiful images you used for this. It wouldn’t be the first time St George defended the British – that’s why he is their patron Saint and the flag of England, as opposed to the Union Jack, bears the Cross of St George. Interesting that they thought it was the Archangel Michael. He is considered a warrior angel, who fights the devil. It brings to mind the idea that the British were numbered with, “legions of angels” and the Germans with those of Satan. It’s a fascinating story. Unless I’m mistaken, some of the soldiers also claimed to seen visions of the Madonna and Child in the sky too. But was it only one side that had the visions? Did the Germans have any similar incidents?